Ella M. Moyer, 82, of Tiffin, and former Republic resident, passed away Thursday April 4, 2019, at Mercy Health-Tiffin Hospital. She was born February 19, 1937, in Bellevue, to Harold and Marie (Walters) Henney. She married Gerald Moyer on May 10, 1958, in Bellevue, and he preceded her in death on October 24, 2007. Survivors include four children, Cindy Moyer of Tiffin, Dale (Diana) Moyer of Terre Haute, Indiana, Judy (Rafe) Kirby of Tiffin, and Jeff (Sue) Moyer of Republic, ten grandchildren, Michael Moyer, Melissa Market, Michelle Yost, Spencer Kirby, Logan Kirby, Emma Kirby, Tommy Moyer, Karina Moyer, Conner Moyer, and Cameron Moyer, nine great-grandchildren, a sister in-law, Janet (Roger) Russell of Bellevue. Ella Mae as preceded in death by a grandson, Colin lee Moyer in 1994, and four brother in-laws, Darrell, Eugene, Wayne and Kenneth Moyer. Ella Mae drove school bus for 27 years for the Seneca East School System. She was a 1955 graduate of Thompson High School. 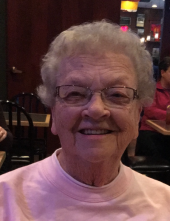 She loved to watch her grandchildren at their sporting events, and going to watch her daughter Cindy at her activities at the School of Opportunity, and going to coffee with her dear friend Mary Lou Reiter of 55 years. Services for Ella Mae will begin at 11:00 am Wednesday, April 10, 2019, at the Lindsey-Shook Funeral Home, 3085 S. SR. 19 Bloomville, with her grandson Pastor Michael Moyer officiating. Burial will follow at Farewell Retreat Cemetery in Republic. Visitation for family and friends will be Tuesday, April 9, 2019, from 4-8 pm. at the Lindsey-Shook Funeral Home in Bloomville. Memorial contributions can be made to the Seneca County Opportunity Center. To send flowers or a remembrance gift to the family of Ella Mae Moyer, please visit our Tribute Store. "Email Address" would like to share the life celebration of Ella Mae Moyer. Click on the "link" to go to share a favorite memory or leave a condolence message for the family.